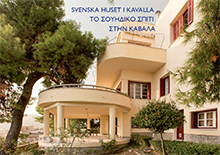 The Kavala Friends’ Association supports the Swedish Institute’s guest house in Kavala. The association consists of people who have visited the Swedish House and want to contribute to it continuing being a nice work environment for scientists and cultural workers. Read more about the Kavala Friends’ Association.